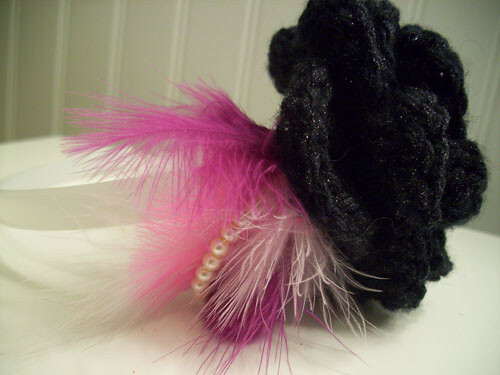 Crochet Flower Headband with Pearls and Feathers, originally uploaded by jennlikesyarn. Introducing my new line of headbands! So far, I've made a whopping one of these, but there will be more coming in the next few weeks as classes wind down for the summer (and I have a glorious 14 days off before Fall session begins). My inspiration was my brief stint into scrapbooking. For the record, I still really enjoy scrapbooking; I just don't have the time right now to indulge. Anyway, one of the latest scrapbooking trends seems to be handmade flowers with embellishments like rhinestones, buttons, distressing, glitter, pearls, and feathers. I thought these flowers would make really fun hair accessories and decided to try my hand at them. 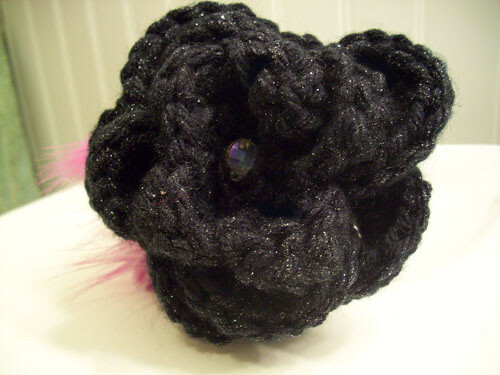 Because my medium of expression is fiber, I crocheted a black flower, neutral because I wanted to be totally obnoxious with the feathers. Then I sprayed sparkles all over the flower. You can't see the detail in any of the photos, but it looks so pretty in person! I really see these being a fun accessory for events like bachelorette parties. I mean, they're awesome for any night out on the town, or to spruce up an otherwise simple ensemble. But I can custom make the flowers and feathers in any color to match a bridal party's theme, and they do come out really cute. If you're interested, you can buy the finished product in my etsy shop. There are also more pictures there, so feel free to check it out! What else can I add to these? What colors would be great? I'm thinking of making one that's all white and seeing how that looks, maybe with gold glitter spray. I've got my work cut out for me! Newer PostThe Knit Kit Now Available - Review and Free Shipping Offer!